1. PREMISES: Lessor, for and in consideration of the covenants hereinafter contained and made on the part of the Lessee, does hereby demise and lease unto Lessee, and Lessee does hereby lease from Lessor, the parcel of land which is located in _____________________________________ County of _______________________ , State of__________________________________________ having a frontage of not less than ____ feet on _______________ containing not less than ____________________ square feet, not including roads or public right of ways, being more particularly described on page 1A attached hereto and made a part hereof, together with all Lessor’s easement rights and appurtenances thereto, all buildings and improvements now located thereon, and all necessary easements and appurtenances in Lessor’s adjoining and adjacent land, highways, roads, streets, lanes, whether public or private, reasonably required for the installation, maintenance, operation and service of sewers, water, gas, drainage, electricity and other utilities and for drive-ways and approaches to and from abutting highways for the use and benefit of the above described parcel of real estate, including the improvements to be erected thereon. If Lessee has the demised premises surveyed, then, at Lessee’s option, the parties shall execute a recordable amendment by which a survey description shall be inserted herein in lieu of the description contained on page 1A, but Lessee shall not be obligated to lease less than is described above. 2. PERMITS: Lessee has entered into this lease in the expectation of obtaining, after expiration of all applicable appeal periods, all permits, licenses, permissions, and/or other authorizations (hereinafter collectively called “Permits”) necessary for the construction upon the demised premises of a complete ________________ restaurant facility, built according to Lessee’s plans and specifications (including without limitation septic tank(s) and/or sewer disposal system(s), if necessary, parking area(s), curb cut(s), sign(s), and any other improvement(s) in connection with said facility deemed necessary or desirable by Lessee), and for the operation of said facility upon the demised premises seven (7) days a week. Lessee agrees to apply for permits without unreasonable delay after the execution hereof. Lessee may (but shall not be obligated to) cancel this lease if after first application therefore, permits are denied or are not obtained within one hundred twenty (120) days. 3. LEASE TERM: Lessee shall have and hold the demised premises for a term commencing on the date of last execution hereof and ending twenty (20) years from the date upon which said ________________ Restaurant is opened for business to the public. When the term hereof is ascertainable and specifically fixed, or otherwise agreed to by Lessor and Lessee, Lessor and Lessee shall enter into a supplement, suitable for recording, which shall specify the actual date for the expiration of the original term of this Lease and for the commencement of accrual of rent payable hereunder by Lessee. of __________ DOLLARS ($____) per month, payable one each on the 15th day of every calendar month for the then current month. In the event that the commencement date of such rent shall be on a day other than the first day of the month, the first rental payment and last rental payment, if applicable, shall be adjusted for the proportionate fraction of the whole month. A. 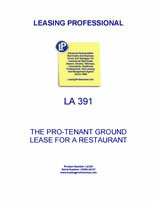 That Lessor shall, if necessary, use its best efforts to obtain the approval of all public or governmental authorities as to all matters relating to zoning, subdivision, lot splits, special use permits or similar requirements for use of the demised premises as a ________________ Restaurant in accordance with Lessee’s plans and specifications as will permit the Lessee to obtain all necessary permits, licenses and approvals referred to in Article 2 above; and that Lessor shall pay and bear all costs for any off-site improvements and dedicate any easements required by any public authority as a condition to the granting of any approval or permit. B. That all water and gas mains, electric power lines, sanitary and storm sewers are located at the property line, in the public right-of-way, of the demised premises and are available and adequate for Lessee’s intended use; or, if the same are not available and adequate, Lessor agrees to extend utilities meeting Lessee’s specifications to the demised premises within thirty (30) days from the date Lessee notifies Lessor that all necessary permits and approvals have been obtained and Lessee delivers its plans and specifications therefore. C. That Lessor shall demolish and remove all existing improvements, encroachments, signs and underground storage tanks, if any, located on the demised premises and shall fill, grade, compact and construct retaining walls to Lessee’s specifications required by Lessee to make the demised premises ready for the construction of Lessee’s improvements, all of which shall be completed within thirty (30) days from the date that Lessee notifies Lessor that all necessary permits and approvals have been obtained and Lessee delivers its plans and specifications therefore.